New to market, the SL106 Hybrid is an immaculate example of one of the most popular models is Sanlorenzo's semi-planing line.Her familiar, yet updated lines reflect over 50 years of nautical expertise and handcrafted quality. Although originally built for the European market, she is a world yacht allowing her to cruise locations spanning the globe. 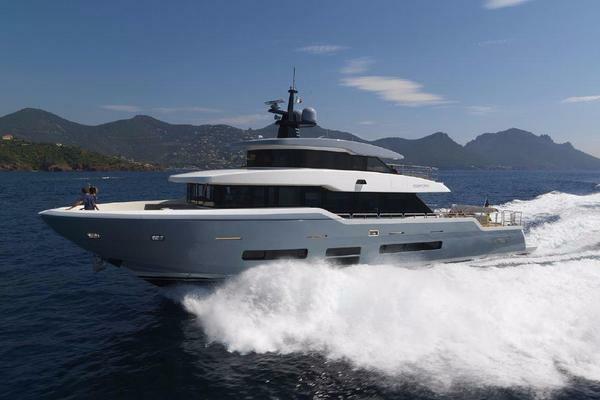 As the first Hybrid yacht to come out of Sanlorenzo, the owner in partnership with the shipyard has maintained her to the highest degree. 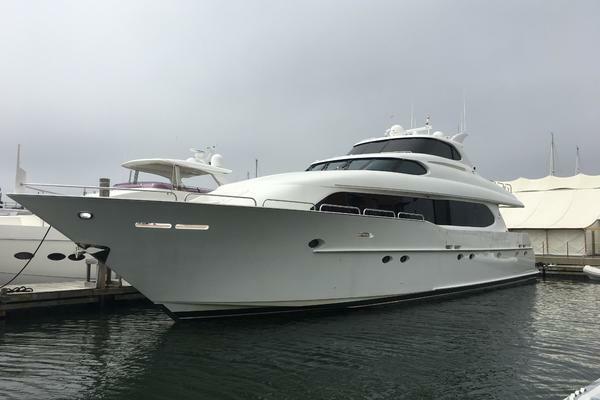 With low hours (400) on her main engines and new generators with 1 year warranty, she offers a fantasticopportunity for a new owner to enjoy her for the summer season with peace of mind. The focal point of the main salon is a stunning hydraulic drop-down terrace. A substantial garage stores a tender and water toys, leaving the decks and flybridge uncluttered for entertaining. At the bowisa seating and sunbathing area shaded by a removable sail-cover style awning. Accommodationsinclude an on-deck Master stateroom, 2 spacious VIP staterooms,and two guest staterooms. For ultimate privacy, all staterooms haveensuiteheads. Bothguest staterooms featurea convertible sliding berth system to allow for a twin or double berth arrangement. Crewaccommodations for up to 5. United Yacht Sales New Jersey would love to guide you through a personal showing of this 106' Sanlorenzo Sl106 2015. This yacht for sale is located in Porto Cervo Italy and priced at $8,750,000. For a showing please contact us by filling out the form on this page and we will get back to you shortly! The SL106 Hybrid is a beautiful planning yacht. Her familiar, yet updated lines reflect over 50 years of nautical expertise and handcrafted quality. Although originally built for the European market, she is a world yacht allowing her to cruise locations spanning the globe. The focal point of the main salon is a stunning hydraulic drop-down terrace. A substantial garage stores a tender and water toys, leaving the decks and flybridge uncluttered for entertaining. At the bow is a seating and sunbathing area shaded by a removable sail-cover style awning. Accommodationsinclude an on-deck Master stateroom, 2 spacious VIP staterooms,and two guest staterooms. For ultimate privacy, all staterooms haveensuiteheads. Bothguest staterooms featurea convertible sliding berth system to allow for a twin or double berth arrangement. Crewaccommodations for up to 5. The Hybrid system is a combination of twin MTU 2,400 hp diesel engines and 180 hp electric motors added to each propeller shaft, operating in parallel with the MTU diesels. In spite of the massive disparity in the rated power of the diesel engines and electric motors, they deliver roughly the same torque to the propeller shafts—up to a diesel speed of 1,000 rpm. As a result, the electric motors can drive this 106’ vessel up to 10 knots. When in diesel engine mode, the electric motors can either be used to boost the diesel engines for faster acceleration or else can be driven as powerful generators. The system additionally includes two 150 kW WhisperPower permanent magnet DC generators and a 150 kWh lithium-ion battery pack. The battery pack is able to deliver such things as overnight air conditioning at anchor without running a generator (one of the key goals of the system). The electric motors are capable of handling all low-speed propulsion until the battery pack is depleted. This eliminates the most inefficient range of diesel engine operation at the same time as it delivers a remarkably quiet ride (another of the key goals of the system). At 9 knots the range in calm waters is around 10 miles. Once the battery pack is depleted, either the generators kick in, or one of the diesel engines can be engaged driving its electric motor as a generator which powers the second electric motor. The combined propulsion and electric motor load on the operating diesel engine is sufficient to drive it into a relatively efficient part of its fuel map, resulting in substantial overall fuel savings as compared to the conventional practice of running both diesel engines at light propulsion loads.